YES, looks like a body in the foreground....surely not. It's possible .. different times .. I saw a report on the gangster couple Bonny and Clyde . .. they were shot in their car by hundreds if not thousands of bullets in a police ambush ... their bodies were left unguarded for a time ( no idea why ) and trophy hunters were apparently clambering about over the bodies pinching memorabilia of the bodies and stripping the cars innards . Supposedly someone cut a finger off to take a ring ! Right! The UK's first what? I am with @zincubus.. first nuclear sub. Think zinc! Top man, your turn! 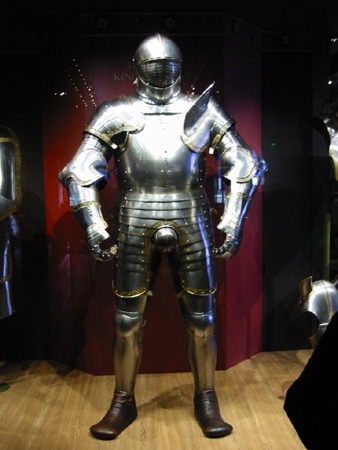 This is a humdinger ..
Armor belonging to the Maid of Orleans. Joan of Arc?